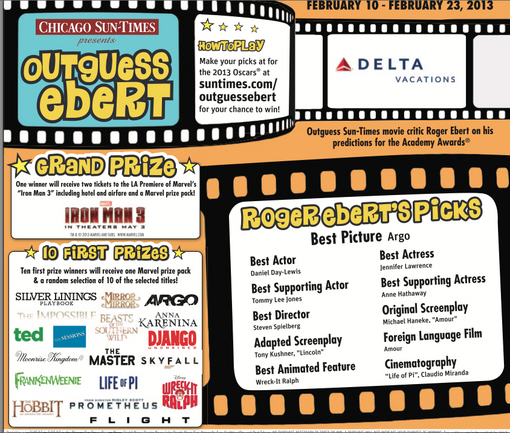 This year's Outguess Ebert contest seems a little like shooting fish in a barrel. For the first time in many a year, maybe ever, I think I've guessed every one correctly. A few years ago, I came across an article about the newly identified psychological concept of Elevation. Scientists claim it is as real as love or fear. It describes a state in which we feel unreasonable joy; you know, like when you sit quiet and still and tingles run up and down your back, and you think things can never get any better. I tried applying it to that year's Oscar nominees. Did it work any better than any other approach? You need Elevating nominees. An example of Elevation would be when the bone morphs into a space station in "2001." Did I feel Elevation in making any of my Guesses this year. That doesn't mean it was a bad year at the movies. Harvey Weinstein, accepting his achievement award from the Producers' Guild, said he thought 2012 was the best in 90 years. Maybe he felt Elevation when he gazed upon the Weinstein Company's box office figures. • "The winner of the Academy Award for Best Picture will be Ben Affleck's tense new thriller 'Argo.' How do I know this? Because it is the audience favorite coming out of the top-loaded opening weekend of the Toronto Film Festival." Unquote. Also, because I had a feeling. Nothing has changed. I did feel elevation during a 3-D shot in "Life of Pi" when the camera looks up from beneath the lifeboat and we experience the ocean's surface as a membrane between sea and sky. But a membrane, an Oscar does not win, and another reason Ben Affleck's film will win this year is that it's a dashed entertaining example of what Hollywood always knew how to do, and seems to be forgetting: It's a great story. Lives are at stake, yet comedy sneaks in. There's a caper needing split-second timing and blind luck. It depends on story and not star power or a franchise. It's Inspired By a True Story of the best possible kind: It makes the movie industry look good while based on an untrue story. Our side tries to rescue some Americans hidden inside the Canadian Embassy in Tehran by concocting a phony sci fi movie named "Argo" as a cover to smuggle a rescue team into Iran during the Hostage Crisis. It is said "Les Miserables" has a chance in this category. That would be an insult to the other finalists. I get the sensation this year that the awards reflect a new Hollywood reality: With so many different ways for audiences to see films, the new emphasis will be on (yes) quality in whatever genre, and away from blockbusters that are pounded down our throats. There are many ways to see movies these days, even on a telephone. A routine picture can be absorbed through many pores. Theatrical screenings were once assumed to be the great mass entertainment. Now they're subtly becoming elitist. A good reason to see a first-run movie in a theater is to join a cool audience that knows why it's there. Friday night at a superior film will feel more like the 8:30 a.m. press screenings at Cannes: We are the select, the chosen few. So onward to the Guesses. The dark horse in some categories this year may be "Django Unchained," which appeals to an academy that is growing so much younger that, in many cases, these people have actually grown up on Tarantino. The realization is sinking in that he's one of the greats and not just this goofy former video-store clerk kid with a chin Jay Leno envies. If the Academy released complete vote totals, I have the feeling that "Django" would be found in second place. 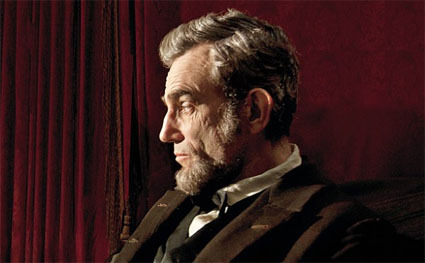 • Best actor: Daniel Day-Lewis for Steven Spielberg's "Lincoln." It's a finely controlled, non-heroic performance. He interprets the character anew, not burdened by its weight of history. Day-Lewis and Spielberg create a Lincoln who is older and less robust than we usually imagine him, and who shows not fiery heroism but great patience as he shepherds his anti-slavery legislation through a congressional maze. This Lincoln makes me think of Obama in the way he doesn't spout off and moves in deliberation. The movie is much about that political process. We understand the 13th Amendment passed not so much for moral reasons, but for immediate pragmatic ones. Lincoln won the necessary votes from the necessary legislators by making those pragmatic schemers an offer they couldn't refuse. Here again, the runner-up is probably "Les Miserables" and Hugh Jackman. God knows he does the best that he can with the material he's given, but what a load of bloated and stagy baggage he has to haul. I remind you that my task here is to predict the winners to help you in the office pool, and not to write new reviews of films. • Best actress: If I were predicting based on Elevation, I'd choose Naomi Watts for "The Impossible," no question, and praise how seamlessly her work blends into CGI to make it all convincing. 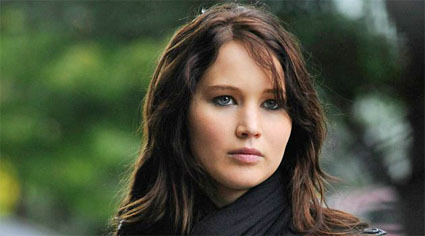 But I'm guessing Jennifer Lawrence, who plays the new lover of the hero (Bradley Cooper) in "Silver Linings Playbook." She's all edges and elbows with this guy who has the misfortune of having chosen professional sports as the avatar for his personal life. "Silver Linings Playbook" would have been an ideal choice for many wives and mothers to sneak out and see during the Super Bowl, and would have given them a lot more to think about than the football game. • Best supporting actor: I would have voted for Christoph Waltz in "Django Unchained," illustrating once again how Tarantino can take an overlooked actor, give him ingenious dialogue and use him to carry a picture. But the winner will be Tommy Lee Jones for "Lincoln." His character is invaluable to the film, and often he projects the conviction that he has private means and reasons that aren't what everyone assumes. 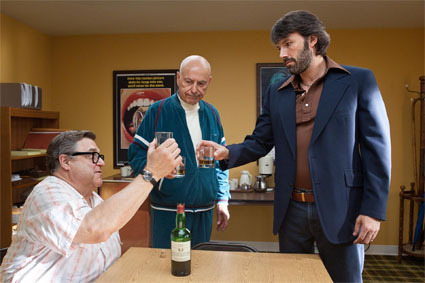 Also Oscar-worthy: Alan Arkin, who with John Goodman helped "Argo" work by providing Affleck with comic Hollywood cutaway scenes to increase tension and avoid the monotone of action. They're in another film, a Hollywood comedy. • Best supporting actress: I'm Guessing Anne Hathaway for "Les Miserables," because she holds the general consensus and we're predicting, not choosing. She may benefit by an occasioal Academy tendency to award this category to what it sees as the Best Picture runner-up. 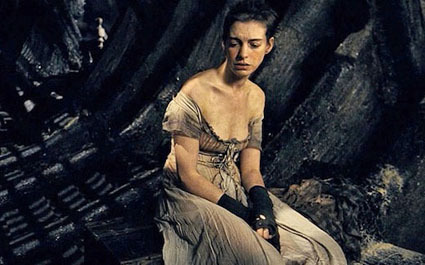 Her character isn't even essential in 'Les Miserables," but how many characters are? The Victor Hugo novel fills its characters with abundant life. The film assigns them to line up and belt out dirges to the camera, which represents he audience. I've seen "Les Miserables," and many eaders have asked me why I haven't reviewed it. I fractured that femur at the time and wasn't up to it. Today I don't have the heart. The Oscars haven't even been held yet, and "Les Mis" is already a picture that is Over With. Supporting Actress is also a category where the voters like to throw a curve ball, and this is where Quvenzhané Wallis could have cashed in some of the love for little Hushpuppy. We've missed the chance to real back at the podium and let out a Hushpuppy shout that would have blown the audience out of their tattoos. • Best Director. This has traditionally been the easiest category to Guess right, because the winner of the Directors' Guild Award almost always goes on to win the Oscar. A funny thing happened on the way to Oscar night, however, when one of the presumed front runners, Ben Affleck, didn't even qualify in the final five. That leaves us with Michael Haneke for "Amour, " Benh Zeitlin for "Beasts of the Southern Wild," Ang Lee for "Life of Pi," Steven Spielberg for "Lincoln," and David O. Russell for "Silver Linings Playbook." I'll pause to observe with what insight and generosity the Academy honored Zeitlin, a first-timer making a daunting low-budget film with all the hazards of a location involving water. 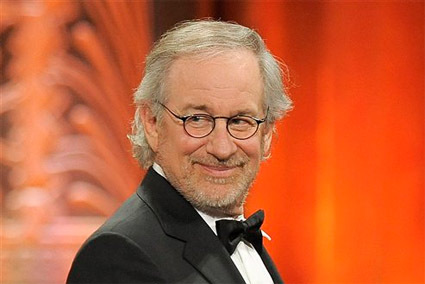 Then I'll move on to predict Spielberg. I'll be fine with that, although observing that "Lincoln" is well within his gifts as a director and that Ang Lee (also overcoming water) achieved a breathtaking breakthrough in 3D in "Life of Pi." That wasn't merely a technical achievement, but permeated the very membrane of the film. 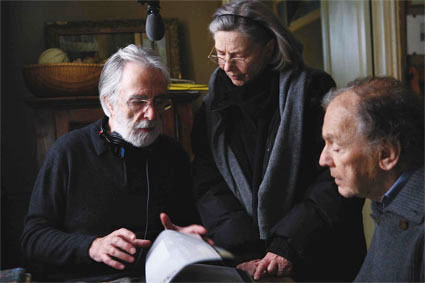 • Best original screenplay: Michael Haneke's Cannes Palme d'Or winner, "Amour," will win. His work avoids the slightest attempt to sentimentalize its story of a long-married, loving couple finally brought down by the realities of old age. Hollywood often believes audieeces aren't prepared to accept he inevitability of a sad ending, and finds a cagey way to Elevate the tone during the end credits. You know, something like Ben E. King singing "Stand by Me." Surely amour can't end in despair? Oh, yes. It can. And does. 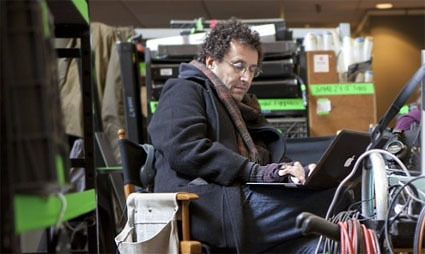 • Best adapted screenplay: Tony Kushner will win for "Lincoln," and deserves to, in taking a story marinated in history and viewing it as something that could have gone either way. The slaves weren't freed entirely for reasons of decency. Working from books about the politics involved, Kushner in "Lincoln" shows that Congress often has cynical and pragmatic motives for its "idealism." • Best animated feature: "Wreck It Ralph," because the Academy members aren't Idiots and in his category often prefers a film that goes somewhere and says something, over cute pandas that use Earth as a trampoline. "Wreck It's" creative inspiration takes place inside video games, like a "Tron," another Disney film from 31 years ago. 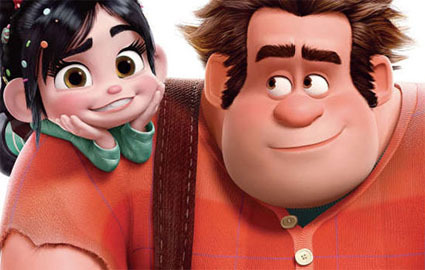 Wreck It Ralph is the avatar who gets assigned to do the munching and stomping. That's no life, and the movie suggests to the kids in the audience to have a little empathy for those who life has typecast as the villains. 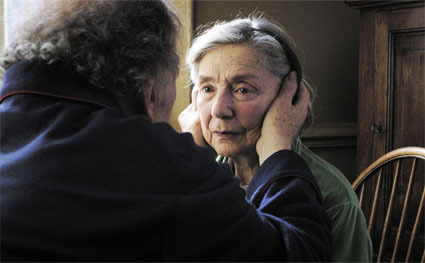 Best foreign film: Haneke's "Amour," hands down. Don't bet against it. • Best cinematography: Although cinematography can involve a great many things apart from "being beautiful," Claudio Miranda's work for "Life of Pi" does those things. For my money, here is a film that justifies the use of treacherous 3-D. Its story of a boat on the wide Pacific risks giving many of its images the appearance of being flat, and Miranda does something I didn't realize was possible. It brings depth to "empty" space. It has no need of those bungee-jumping pandas that zoom toward us. Long shots and close shots all take place in tangible space. We see the boy and the tiger and the Pacific Ocean is behind them, and we can see that it is. I don't know how it's possible, but empty air takes on presence. A lifeboat might seem claustrophobic. Miranda's cinematography raises the passivity of agoraphobia. ✔ The contest runs starting 2/10 and ends on 2/23 at midnight. ✔ Full-page and half-page ads will run in all Sun-Times / Wrapports publications with links to the contest. 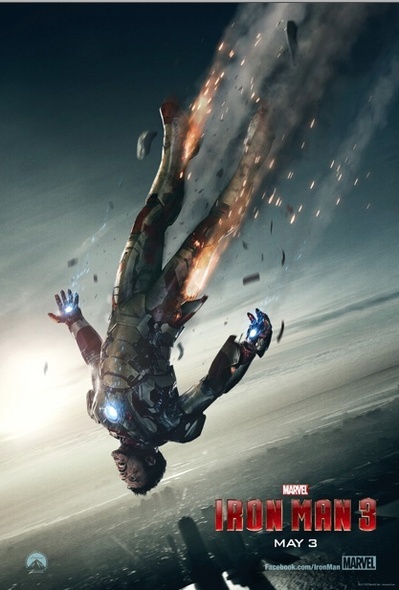 ✔ Grand Prize: One winner will receive a trip for two to L.A. to attend the premiere of Marvel's "Iron Man 3." Includes roundtrip airfare (to and from Chicago) and hotel accommodations from Delta Vacations, and a Marvel prize pack. ✔ First Prize: Ten first prize winners will receive one Marvel prize pack and a random selection DVD tiles. ✔ Delta and Walt Disney Studios Motion Pictures have provided all of the prizes. ✔ In the event of a tie for either the grand prize or the first prizes, the tied entries will be selected by a random drawing of all such tied entries will be held to determine the winner(s). ✔ The contest runs starting 2/10 and end on 2/23 at midnight CST.